Waterberg Guest Farm is conveniently situated just off the main road, halfway between Namibia's capital, Windhoek, and the world-famous Etosha National Park. It is the perfect place for your first or last stop. Here you can relax from your flight to set off on your tour around Namibia well-rested or you can let your experiences of your travels through Namibia sink in before going home. Ideally guests should stay two nights, in order to take advantage of the various activities establishment offer. Establishment also have a 1 400 metre compacted soil airstrip on the ranch to cater for fly-in guests. 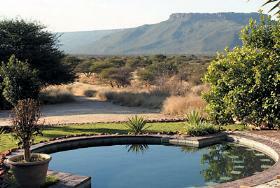 The nearest town, Otjiwarongo, is 63 kilometres from Waterberg Guest Farm. Waterberg Guest Farm forms the nucleus of the Waterberg Conservancy, which includes the Waterberg Plateau Park - a combined area of over 180 000 hectares - committed to the conservation of flora, fauna and fragile ecosystems that are fast disappearing across Africa. A substantial area of both the "Waterberg" and "Small Waterberg" plateaus lie within the boundaries of Waterberg Guest Farm. This area is home to an incredible variety of free-roaming Namibian wildlife - from the majestic leopard and the cheetah to the wily jackal, herds of antelope such as the eland, kudu and Oryx, the graceful little steenbok, klipspringer and tiny Dik-Dik. Host guests are pampered in a style befitting the spectacular surroundings. Apart from comfortable en-suite rooms, guests can also soak up the atmosphere of the unspoilt African bush in host secluded bush bungalows - situated about 160 metres from the main homestead. Built entirely of natural materials from the surrounding mountains, they offer all the modern amenities wrapped up in good old-fashioned romance! In order to share the natural beauty and heritage of the Waterberg and their passion for conservation with visitors, Harry opened the Waterberg Guest Farm in 1995. The original 1930s manager's house was converted into a guesthouse with 4 double and twin rooms, all with en-suite bathrooms. All rooms have toilets, showers and basins (one of the rooms also has an additional bathtub). All rooms have their own private entrance leading out to a veranda. 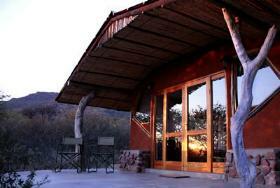 In addition to the guesthouse, there are two luxury "bush bungalows" situated 160 metres from the main guesthouse. The truly unique bungalows are built according to the traditional Herero method. As Herero tradition dictates, the basic structure is fashioned from wooden poles harvested from non-indigenous invader bush, thus assisting in combating bush encroachment. These are then covered with a mixture of clay from termite hills, mixed with "ombumbi", which is smeared on by hand by the women of the village. While the bungalows themselves are constructed with only natural materials, the interiors are decorated in contemporary African design and offer all the modern amenities to ensure your comfort. They also offer the unique choice of showers either inside or outside, surrounded by breath-taking views! The traditional African grass-roofed "lapa" next to the swimming pool offers al fresco dining and a fully stocked "honesty bar". Here guests can sit on the wooden deck and watch the floodlit waterhole as antelope, warthog and the occasional leopard come to drink, and in turn, be watched by host resident family of baboons. Activities: Guests at Waterberg Guest Farm can choose from a wide variety of activities such as spectacular nature hikes, a visit to the neighbouring Cheetah Conservation Trust as well as an early morning or sundowner drive to the so-called "Little Serengeti" or peruse host extensive library. In order to accommodate your wishes and to advise guests on the available activities, establishment suggest that you let us know of your intended activities during dinner. Hike on Small Waterberg: The guesthouse is situated on the slope of the Small Waterberg and establishment can highly recommend a hike up to the plateau. A brisk 45-minute-walk brings you to the natural spring, the source of host exceptionally pure spring water. There are several resting places and lookout points on the way. Hosts suggest that guests start this in the early morning in order to avoid the midday heat. Please remember to take enough water along with you. Upon your return, you will be treated to a sumptuous breakfast at around 9:30am. Visit to Cheetah Conservation Fund Education Centre: The world-renowned Cheetah Conservation Fund (CCF) is host northern neighbour and a valued member of the Waterberg Conservancy. Their Education Centre informs you of the plight of the free-roaming cheetah and other predators. Learn how farmers cope with predators, which cause losses to stud calves, sheep, goats and Arabian foals, and about the efforts of Cheetah Conservation Fund and their very dedicated staff to address the survival of the Cheetah on Namibian farmland. Experience "Little Serengeti": Previously a vast maize field, all the bush has been removed from this 1 600ha grassland offering the only place in the region where free-roaming antelope gather to graze in their hundreds without the restriction of game fences. Imagine enjoying a sundowner in an open vehicle, accompanied by host knowledgeable game guide and surrounded by over 500 head of game. Many visitors choose to combine the "Little Serengeti" with a visit to the Cheetah Conservation Fund Education Centre, which will give you a realistic impression of the challenges and successes of conservation in Namibia. Cheetah Run: As a morning activity establishment offer a drive to the "Little Serengeti" and the CCF Education Centre. Amongst the abundant number of game you will enjoy the sunrise on the field at the foot of the Waterberg. Afterwards you can witness the so-called "Cheetah Run" at CCF, where you will see cheetahs in action, providing a unique photo opportunity. Waterberg Plateau Park: The State Park at Waterberg Plateau, called Bernabe de la Bat Camp, is situated on the beautiful eastern slope of the Big Waterberg, 21 km from Waterberg Guest Farm. 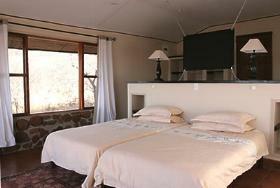 It is one of Namibia�s most beautiful state resorts and is ideal for a day visit. Big Waterberg Plateau has been declared a "wilderness area" and can only be accessed through Nature Conservation. A game viewing drive on top of the plateau can be arranged through the Bernab� de la Bat Camp, from where you can take a guided drive onto the plateau to see Rhino, Buffalo, Sable and Roan Antelope. Extended Excursions: Longer excursions to other spectacular areas of this vast and beautiful country, such as the world famous Etosha Pan Game Reserve, the Namib Desert, Sossusvlei or the Skeleton Coast, to name but a few, can also be organized.